It is another edition of Show Your Stuff. Link up whatever you are proud of showing. Thanks to everyone who has participated so far, I wish to keep this going for a while. 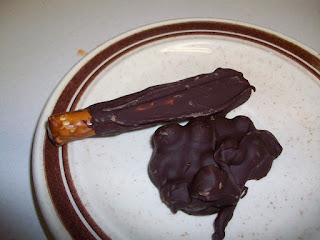 I am showing off some chocolate candy my husband did recently, it is chocolate cover pretzels and caramel clusters using caramel bits. I know my link is not a recipe-so, I hope that's ok! So fun, thanks so much for this! Those caramels sure look yummy! Thanks for sharing, and thanks for hosting! Thanks so much for the invite. A few blog friends and I are collectively presenting a new challenge idea that we would love to have you join. If you have a second, check in at http://www.thespacebetweenblog.wordpress.com on Monday to learn more, and feel free to email me if you have any questions! Thank you so much for hosting! New follower! Following some of your friends up there too. Thanks for commenting on my blog. I love to join your party. I'm the one with the Bow Bracelet Tutorial. Thank you so much for the invite, sorry it took me some time to link up. Have a great day!